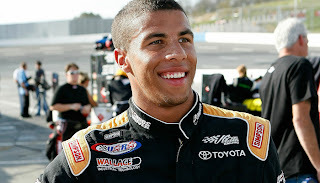 Darrell Wallace Jr., a development driver for Joe Gibbs Racing and successful participant in NASCAR's Drive for Diversity program, will run fulltime in the NASCAR Truck Series in 2013, the Observer and ThatsRacin.com have learned. Wallace, 19, will drive for Kyle Busch Motorsports but remain under contract with JGR. Busch drives in the Sprint Cup Series for JGR. An official announcement of Wallace's move is expected Saturday during the NASCAR Preview, part of NASCAR Acceleration Weekend activities, multiple sources confirmed Thursday. 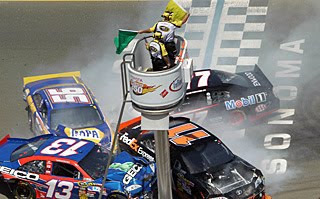 JGR officials declined to comment. Wallace would become the first African-American driver to run fulltime in one of NASCAR's three national series since Bill Lester's last season in Trucks with Bill Davis Racing in 2006. Wendell Scott remains the only African-American driver to win a race in one of NASCAR's three national series. He won in what is now known as the Sprint Cup Series on Dec. 1, 1963, at Speedway Park in Jacksonville, Fla.
Wallace made four starts in the Nationwide Series in 2012 with JGR and earned three top-10 finishes, including a career-best seventh at Iowa. He has six wins in the K&N Pro Series East since 2010, including one in 2012. Born in Mobile, Ala., Wallace has spent most of his life in the Charlotte area and graduated from Northwest Cabarrus High School in Concord.